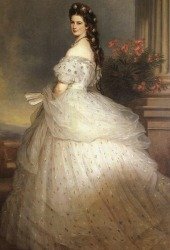 Born as a duchess, best known as Empress Sisi, Elizabeth of Austria was way ahead of here time. She was a rebel, always looking for ways to escape the strict protocol of the Habsburg court, and her mother-in-law. Her story is well known through many books and films. Most of the time they paint a romantic picture that could not be further from the reality. Sisi was beautiful, but also depressed, lonely, misunderstood and probably suffering from eating disorder. In the end she is stabbed to dead by at age 66. She dies alone, except from some servants. Her son is dead, her daughters and husband are detached from her, and she spends her last years travelling the world to find salvage. 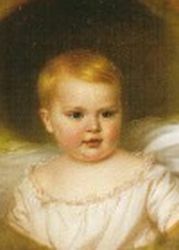 Her Royal Highness Duchess Elisabeth Amalie Eugenie was born on Christmas eve on 24 December 1837. She grew up at Possenhofen Castle on the shore of Lake Starnberg in Bavaria, Germany. The family called her Sisi. Her father was Maximillian, Duke in Bavaria ( since there could only be one Duke of Bavaria all the other members of the Wittelsbach family used the title Duke in Bavaria). 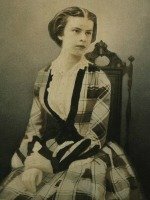 Her mother was a real Princess; Princess Ludovika of Bavaria was the sixth child of King Maximilian I of Bavaria and Queen Caroline. They were second cousins and the marriage was arranged by their fathers. Their marriage was not as happy as depicted in the Sissi films. Maximilian had many mistresses and extramarital children. Over the years the relationship improved, especially when Ludovika kind of accepted the affairs of her husband and his frequent absence. Schloss Possenhofen at Starnberger See. 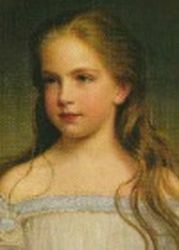 The childhood of Elisabeth of Bavaria was happy and free, with enough time for horse riding and swimming in the lake with her seven surviving siblings. She probably also played with the illegitimate children of Duke max. He had many, and some of them often visited at Possenhofen. It was said he even preferred the company of his illegitimate children above that of the children he had with Ludovika. 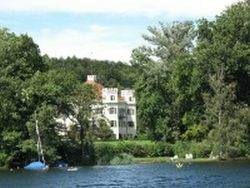 Schloss Possenhofen is currently privately owned and has luxurious appartments in it. It is not open to the public but walking round the Starnberger lake you can get a good look at the castle. 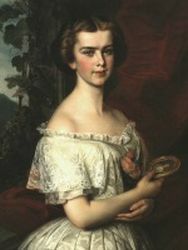 This painting shows Elisabeth of Bavaria holding a medallion with the picture of Franz Joseph. 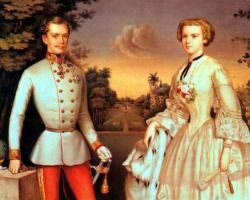 In 1853 Archduchess Sophie, the mother of Emperor Franz Joseph I of Austria decided that he should be married to his nice, Duchess Helene in Bavaria, the older sister of Sisi. 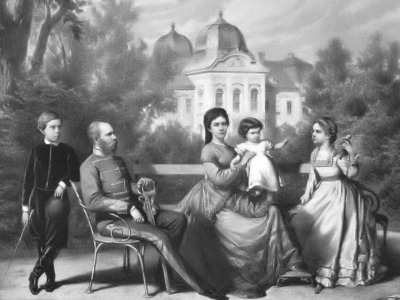 She informed her sister princess Ludovika to meet her and her son in the Kaiservilla in Bad Ischl. 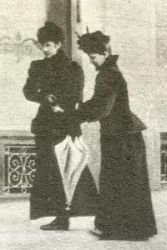 The fact that Ludovika decided to take her younger daughter Sisi along on the trip changed the course of history. Emperor Franz Joseph defied his dominant mother for the first time in his life and choose Sisi over Helene. Sisi was 15 years old at time of their engagement, which was announced five days after they met! Eight months later they were married in Vienna and Sisi became Kaiserin Elisabeth of Austria. Duchess Helene is devastated, as you can imagine. She thought she was gonna be the new Empress of Austria! Having spend her childhood in the relative freedom she could never get used to the protocol of the Habsburg court life. From the start she had a very bad relationship with her mother-in-law, whose belief was the king's consort's only ambition should be to produce an heir to the throne. She should not have anything to do with state affairs and has no value what so ever if she is not mothering a crown prince. Empress Sisi did not agree with her on any of this. 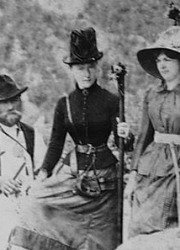 She was especially committed to the Italian and Hungarian parts of the empire and would try to influence Franz Joseph on the politics related to this whenever possible. Read all abouth the beauty secrets of Empress Sissi here! Sisi gave birth to four children. 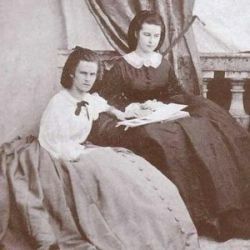 The first two where daughters; Sophie (5 March 1855) and Gisela (15 July 1856). 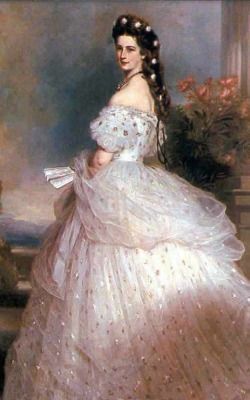 Archduchess Sophie immediately took control over the children, taking them away from the care of their mother since she should spend all her time doing her duties as the Empress of Austria. 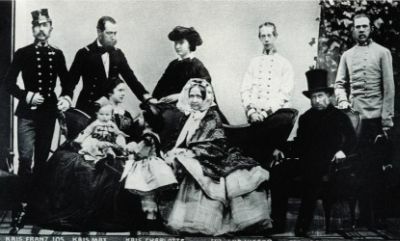 In 1857 Sisi took both her children on a trip to Hungary, against the advice of both Sophie and the Court physicians since the children where not well. 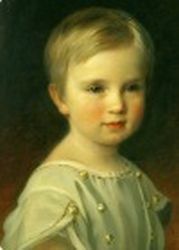 The trip ended tragically since princess Sophie died, probably of typhus, only three years old in 1857. This caused the first of Sisi's many depressions and of course reinforced the opinion of the Archduchess that Elisabeth of Bavaria was not fit for motherhood and should not be in charge of the royal children. In 1858 Sisi finally gave birth to Crown Prince Rudolf who was also taken away from Sisi immediately. Since she had no control over the most aspects of her personal life empress Sisi started to work on her own body, through hearse workouts, fastening and tight lacing she got the slender wasp waste looks that she is famous for. Next to exercise and horse riding her new passion became travelling. She felt she was not needed at court anyway and often left the country for months on end. 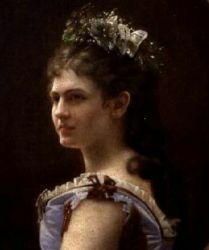 After the birth of Crown prince Rudolf she refused her husband in her bedroom most of the time and distanced herself even more from her husband children and court life. Clich here to see read all abouth Sisi's Hungarian coronation dress. 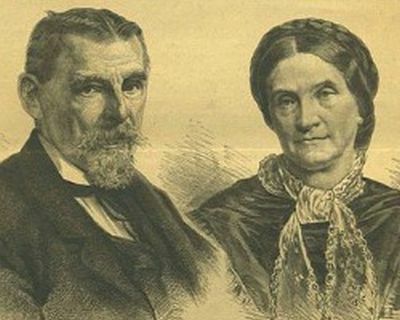 In 1867 her efforts in the politics of Hungary paid of and Franz Joseph was crowned King of Hungary and Elisabeth of Bavaria became Queen of Hungary. As a coronation gift the Hungarians gave the couple the Royal Palace of Gödöllő. Sisi enjoyed the country and the people and spend much more time there than in Austria. This annoyed Archduchesses Sophie who despised the Hungarian. 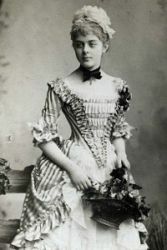 This short happy period resulted in the birth of Archduchess Marie Valerie (22 April 1868). Sisi referred to her youngest daughter as the Hungarian child and had a solid relationship with her unlike with her other children. 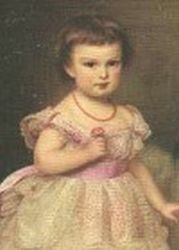 Marie Valerie was the only child she was allowed to raise herself and keep with her on her many travels. A few years passed before tragedy strikes again (except for the death of Sophie in 1872, but that would not have been much of a tragedy to Empress Sisi…). Front row: Empress Elisabeth, Crown Prince Rudolf, Archduchess Gisela, Archduchess Sophie and Archduke Franz Carl of Austria. 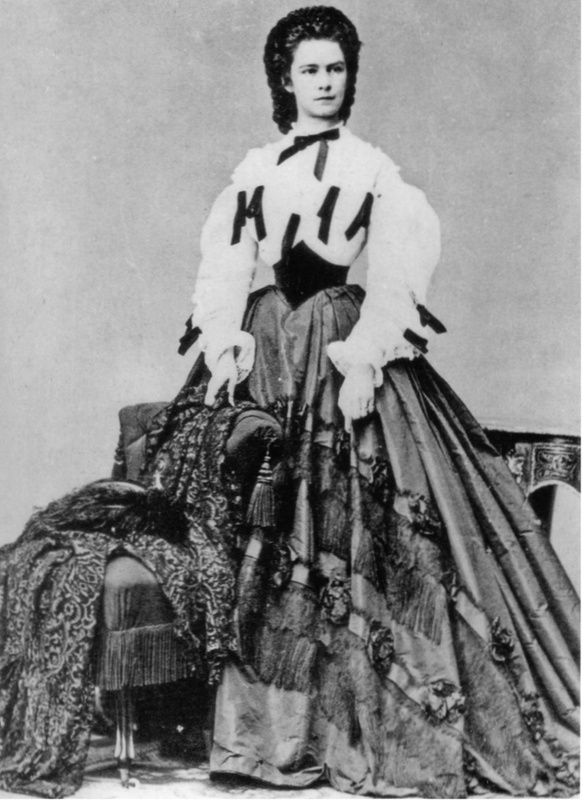 In 1886 Sisi introduced the actress Katharina Schratt to Franz Joseph, and they started having an affair. It is believed Sisi did this on purpose so the emperor had some company whenever she was travelling. In the same year her favourite cousin, King Ludwig II mysteriously drowned in lake Starnberg. Sisi starts traveling to England where she of the takes part in hunting parties. She is believed to be one of the greatest amazons of her time. She travels all over Europe, and has her own palace build at Corfu, Greece. In her final years she spends several months each year at the Achilleon Palace. 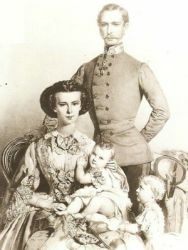 Since the Austrian government and emperor Franz Joseph wanted to secure the reign, Crown Prince Rudolf was married of to Princess Stéphanie of Belgium in 1881. This was not a happy relationship and Rudolf had many affairs. His last one was with Baroness Mary Vetsera. 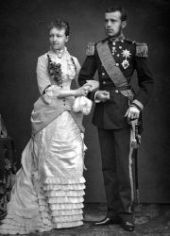 In these terrible years Rudolf and Mary Vetsera were found dead in Mayerling, a hunting lodge in the Wienerwald. Officially Rudolf died of a heart attack, but the hole in his head proved otherwise. Letters from Mary to her mother were found, proving that she knew she was going to die soon. The current belief is that the two lovers made a suicide pact. It is, however, still a mystery how Mary died since only one bullet was found. Mary died a few hours before Rudolf, so common belief is he killed her before killing himself hours later. After these tragic events Kaiserin Sisi withdraw completely from public life. She was rarely seen, always on the run and hiding for her subjects and the press. She could not handle getting old very well either, so pictures of her in the later stage of her life are very rare. Whenever a photographer saw the opportunity to take picture of here she would quickly hide behind her fan or veil. Because of this and also because the 3th Sissi film ends when she was still very young, common believe is that she did not get very old. She did, however, die at age of 60 and had been empress of Austria for 44 years. 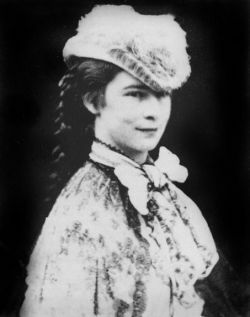 In September 1898 Empress Elisabeth is staying in the swiss Hotel Beau Rivage. 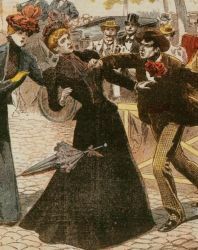 On 10 September 1898 the Italian Anarchist Luigi Lucheni stabs her while she is walking on the promenade to catch a boat in Geneva. She dies of her injuries soon after, not knowing what happened to her. 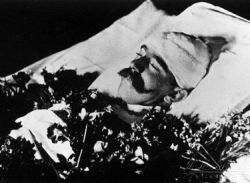 Emperor Franz Joseph was heart-broken. He died in 1916. Fantasy image of the assassination of Sisi. In reality she thought that Luigi just bumped into her trying to steal her purse. She did not know he stabbed her. She just continued on her way and collapsed later when she was already on board of the boat. 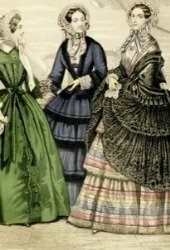 Only after her lady in waiting saw a small stain on her dress and her corset was removed the stab wound was found. 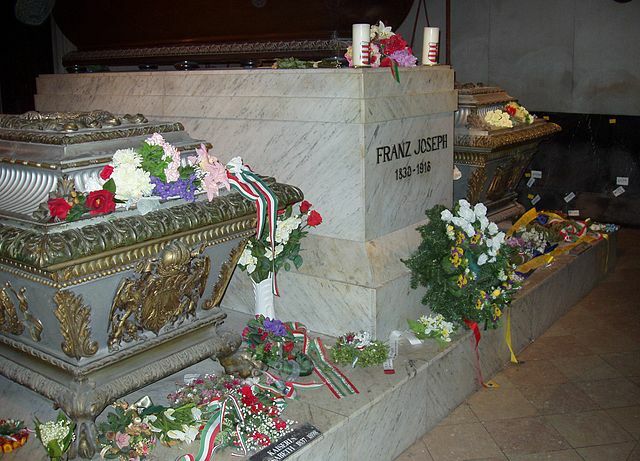 Empress Sisi is buried in the The Imperial Crypt beneath the Capuchin Church in Vienna. Here she rests together with her son, Crown Prince Rudolf, her husband, Emperor Franz Joseph and some 140 other Habsburgers.